Yesterday, I had the complete pleasure of working with a beautiful bunch of women who attended my final 'Release the Artist Within' workshop for 2013. I still have to pinch myself sometimes that people want to learn from me and my approach to Art-making. It's truly what dreams are made of! After setting the scene with some feeling and colour based processes, the ladies set off to create backgrounds for their Artworks, using only fingers and sponges. I love the drawing sessions in my classes. Over the years as a preschool teacher, I've learned how to approach learning in really open, freeing and accessible ways, which is really important when teaching drawing techniques, I think. People often tell me they can't even draw a stick figure, and I show them how to draw sticks instead! Ha ha! Seriously though, there are so many beautiful ways to 'suggest' an object rather than make it look like a photo, and this knowledge alone is an empowering viewpoint to create from. I then went on to share ways to translate our drawings into collage techniques, to build up some texture and interest in our works. 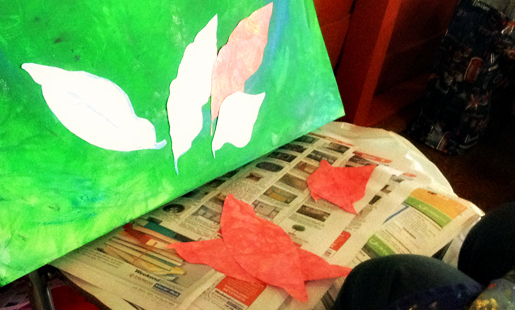 We also used our colour-work paintings and nature drawings as collage items for Artworks. So much gorgeousness to work with! Kelli's amazing painting was beginning to match her clothing! 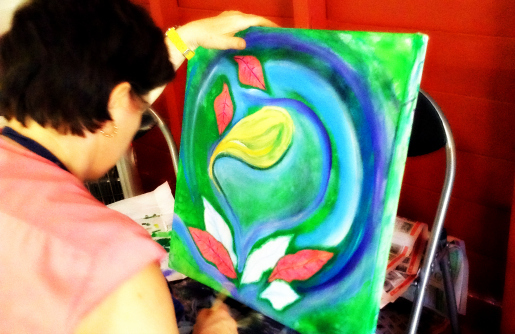 In the final hours of the class, I go around to everyone individually, to support each person with tips and techniques to bring their paintings towards the finish-line. Ta daaa! 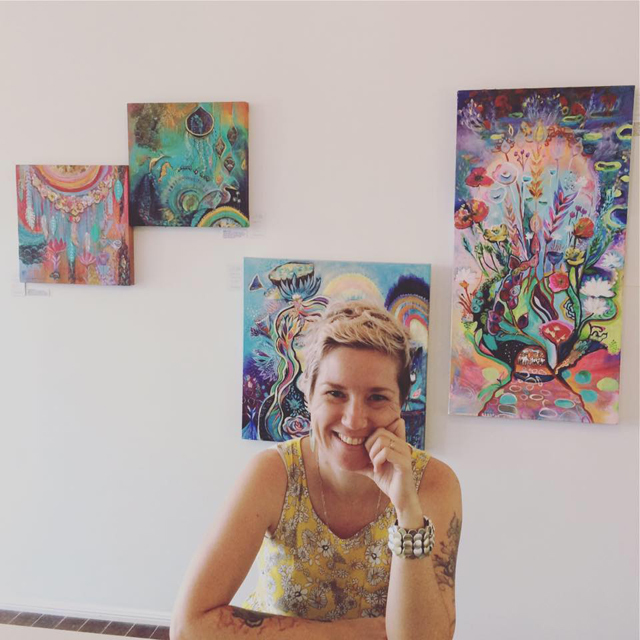 Beautiful day, beautiful people, beautiful Art! A deep and heart-felt thank you goes out to all these amazing women, for sharing their day, hearts and creativity with me. I felt truly blessed and honoured to work with these gorgeous people and share my Artsy love! 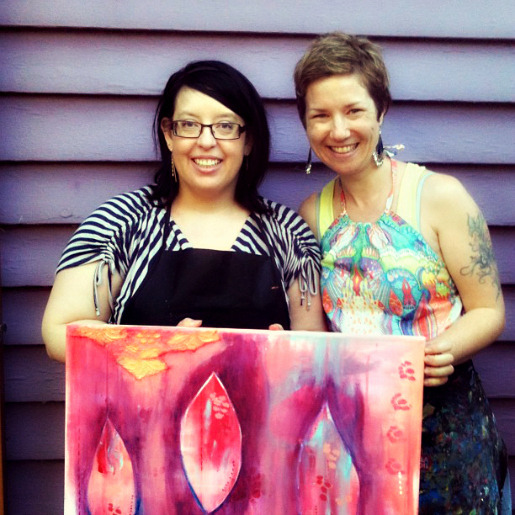 "Me and the amazing @artbychrissyforemanc after the workshop today. Beautiful teacher / beautiful heart. 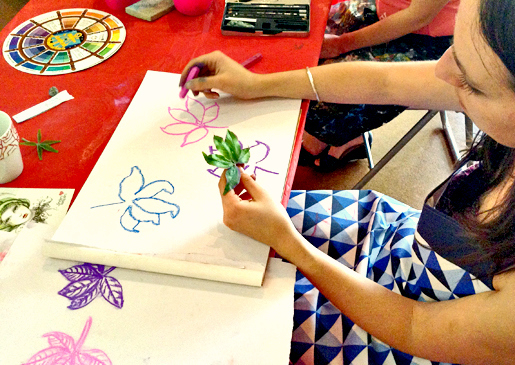 Most relaxing art workshop I've ever done." My final workshop for 2013 is next week's Mixed Media Mother & Child class. After that, I'm taking a break from workshops until 2014, while I work on my new fabrics range - YAY! Thanks to all the amazing Artists who have attended my classes this year. I've learnt something beautiful from every one of you! My demo painting from the workshop.